According to the American Lung Association, paraffin candles contain 11 documented toxins, two of which are known carcinogens. Protect the environment and your body at the same time by only using organic beeswax, soy or hemp candles. Spending a little more money or time locating organic non-toxic candles appears to be worth it in regards to your indoor air environment and your health. Most conventional candles are made from paraffin wax, which is a by-product of petroleum, a non-renewable resource, which has been linked to poor indoor air quality. Paraffin candles release a petro-carbon soot that stains your walls, furniture and is circulated through your air ducts. This soot, according to the American Lung Association, contains 11 documented toxins, two of which are known carcinogens — toluene and benzene. Some paraffin candle makers are still using lead core wicks which when heated emit lead particulates into the air, which can then be inhaled. 100% of lead that is inhaled is absorbed into the bloodstream. Children’s developing bodies are particularly vulnerable. Chronic low-level lead exposure, as seen with lead wick use, has been found to produce permanent neuro-psychological defects and behavior disorders in children, including low IQ, short attention span, hyperactive behavior, and motor difficulties. There is no longer a need to buy paraffin candles due to the wide availability of soy candles and beeswax candles, and to a lesser extent bayberry candles and even tapioca wax candles. Green Promise has compiled a list of our favorite organic candle suppliers. Buying organic candles supports organic farmers who practice environmentally and socially responsible forms of agriculture. Beeswax and soy candles both burn cleaner than petroleum-based candles plus they are renewable. The list below only includes organically produced beeswax, organic soy or vegetable wax candles (or at least non-gmo soy). This list will be updated periodically, but if you notice any errors or know of a company that belongs on this list, e-mail Green Promise at resource@greenpromise.com. Light the way! Earth-friendly, USDA certified organic and sustainably harvested bee's wax that contains no GMOs with 100% cotton wicks. It's a sure thing with their scent Shore Thing, reminiscent of a sand and sea sprayed day of beach. If water's not your thing, then try the Tree Fort candle for a more earthy experience. Stunning soy and beeswax candles. Our favorites: the beeswax coral candles for their unique shape and the soy candles set in furniture-grade bamboo. Handcrafted candles with lead-free cotton wicks, natural gmo-free soy wax from American Farmers, and hand-selected fragrance oils. Candles are dye-free and available in assorted sizes. This company offers some organic beeswax candles, but also offers bayberry candles. While they are not organic (we haven't found a source of organic bayberry candles yet), they are made how bayberry candles should be made. Organic Hemp oil candles available in 3 aromas: Mystic Mango, Northern Lights, and Orbital Orange. Also available in pretty tins that can definitely be re-used. The eco candle company makes hand-poured soy wax candles from a base of soybeans and pure botanical oils. They support American farmers by using US grown non-gmo soy beans. Their wicks are made from natural cotton, paper or hemp. Green Promise likes the "MANdles" — candles for men such as the "Mama's Boy" candle with a scent of fresh laundry. Made with organic soy wax and lead-free wicks. Available in glass tumblers or jelly jars. Hand poured soy candles made from non-gmo soy that is free of pesticides and herbicides. They offer travel tins, glass tumblers and tea lights. Lumia has developed its own organic wax from organic soy wax blended with other non-petroleum organic waxes to create beautiful organic candles which supports organic farmers who value our Earth. Organic soy wax candles with unbleached lead-free cotton wicks. Wholesale and private labeling available. Organic beeswax candles from Australia. The company is headquarted in an eco-friendly building, their packaging is made from recycled cardboard, and printed with non-toxic, renewable soy-based ink. 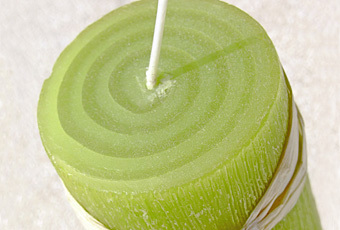 In the states, you can find Northern Light organic beeswax candles online at eZoetic.com out of California. Handcrafted, 100% natural Organic Soywax Candles with therapeutic-grade essential oils. Made with organic soy wax (a washable, biodegradable and renewable resource) and custom blends of essential oils coupled with cotton wicks and reusable glass containers. Q Candle's aromatherapy soy candles are environmentally friendly, containing no animal products or synthetic ingredients that could contain toxins and is a natural & clean alternative to petroleum based paraffin wax. Donates 10% of all sales to charity plus an additional 2% to the Rain Forest Rescue program. Hand poured non-gmo soy wax candles in reusable/recyclable containers. Discounts available for hosting an online candle party! Soybeam candles contain certified organic or wildcrafted essential oils and GMO-free soy wax and pure cotton wicks. Made in the USA. Candles come in green recycled reusable glass containers packaged in recycled paper printed with soy inks. Luxurious candles made from certified organic soy, organic vegetable was and 100% cotton wicks. All candles are poured into reusable and recyclable containers. Travel size candles in 2 oz and 4 oz tins, and 7 oz candles in beautiful square glass containers. Aromatherapy Candles made from 100% soy wax from non-GMO soya beans, 100% pure essential oils and natural braided-cotton wicks. Try Creme Brulee (yum!) or Fruition which incorporates the essence of lemon, lime, sweet orange and grapefruit.